We are extremely delighted that you have chosen the platform of Aaghaz-e-Dosti (AED) for contributing to the noble cause of peace between India and Pakistan. AED is a civil society organization, more so an independent movement, one of its kinds in South Asia where Indians and Pakistanis can have a dialogue with each other. AED, an offshoot of Mission Bhartiyam (India), is a collaborative venture along with Hum Sab Aik Hain (Pakistan). At AED, our aim is to offer diverse and fresh perspectives to the India-Pakistan discourse and encourage dialogue on pertinent issues by using various mediums. 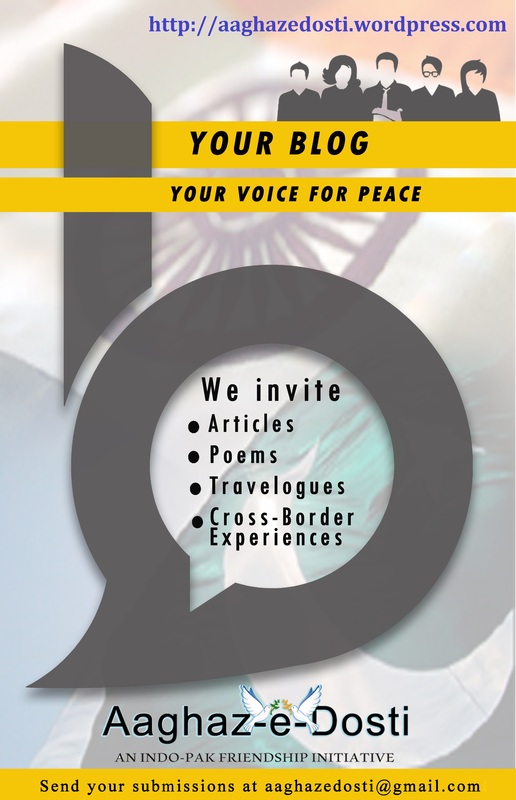 For this purpose, we encourage bloggers and writers to share their opinions on issues relating to South Asia, international politics, peace-building and conflict resolution in general and India-Pakistan issues in particular. When submitting a blog/write-up to AED, we request you to honour the following guidelines. This will facilitate us in disseminating good quality and analytical content on our forum. Our objective is to spread peace and encourage dialogue and hence we out rightly reject content that doesn’t confer to the same. Any content that aims at spreading hatred, discouraging dialogue and forwards only a prejudiced point of view will not be published under the aegis of AED. While we encourage writers to put forward their opinions, we highly value content that is balanced, does not take sides and that offers a comprehensive perspective to readers. You are more than welcome to write on a wide range of issues right from South Asian politics to global affairs to peace building to international issues, however, we would appreciate if what you write relates to the Indo-Pak context in some way of the other. Since the broader goal of the Indo-Pak movement is peaceful relations between India and Pakistan, articles on specific issues concerning India-Pakistan relations will be highly appreciated. AED is popular among a wide variety of people the world over and we have people from different regions reading content that we produce and quoting us as well. Hence, writers are requested to use language that is simple, lucid and precise. We value people’s experiences and stories and will be delighted if you are willing to share the same with us. Stories are powerful tools of change and if you decide to share your story, please do try and elucidate it with some examples of how your experiences of interacting with the ‘other’ have changed your views. We believe in the power of positive personal stories. You can contribute on a range of subjects like – your experiences of visiting the other country, your experiences of interacting with people from the other side and the impact that it has had on your life. You are requested to add your own examples that emanate from your experiences. This makes the write-up more credible, close and real. Length of the Write-ups: An article or travel experience usually varies from 500-800 words. However, we also welcome longer pieces. A story can be short but should not be less than 300 words. For Non-English Poems: We welcome poems in Hindi and Urdu. We also welcome poem submissions in Punjabi, Sindhi, Pashto or any other language spoken in the subcontinent but we will require a rough translation in English. We prefer carrying original, unpublished articles. Do not send us your article if you have sent it for publication anywhere else at the same time. If you do not receive any email regarding acceptance of your write-up within 3 days, please feel free to submit it elsewhere. We may publish previously-published articles but only in exceptional cases and with some minor changes. The writer is also required to duly inform us along with providing the link where the article has been previously published. We have a team of blog editors who will help fine-tune your article and you can at any point in time get in touch with them and seek their suggestions on your write-up. Since this is a non-funded initiative, we will not be able to offer any monetary remuneration. Towards the end of your write-up, please make sure you share with us your photo and a one or two liner bio of what you do and what makes you associate with the India-Pakistan cause. We are happy to have more members on board join our cause. In case, you would not like us to share your identity in the public domain, we perfectly understand. If there are any photos that you feel can be shared with the write-up, the more the merrier! Please do inform us about the source of these photographs. We do not publish photos without source. AED has a vibrant presence on social media and hence our job does not end with writing. We would like more and more people to learn about our movement and join it. While we share the writings widely across our network, you are also requested to share your write up on your social media platform as a part of our efforts to help the cause gain a wider audience. Blog Editors: Devika Mittal, Dr Nidhi Shendurnikar Tere, Madhulika Narasimhan and Sheharyar Rizwan. Posted on November 27, 2016, in Articles. Bookmark the permalink. Leave a comment.